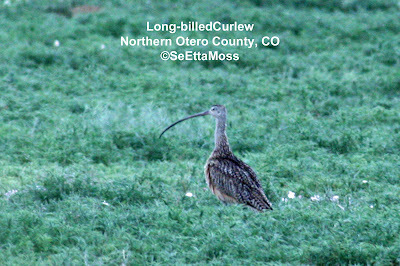 While driving on a county road in northern Otero County, Colo today I spotted a pair of Long-billed Curlews flying nearby. After slamming on my brakes and parking quickly I was able to refind these two and watch them fly back and forth across the county road I was on. They began vocalizing in the very distinctive way of their species. They landed and flew about, then walked about for a bit. 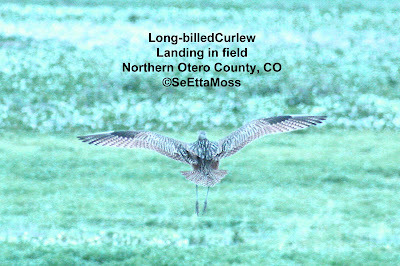 Then I saw what looked like a young curlew--maybe 2/3 the size of the parents. The young bird walked with the two adults as they vocalized a lot now. Then they flew off into the grasslands away from the road and I lost track of them and the young bird. 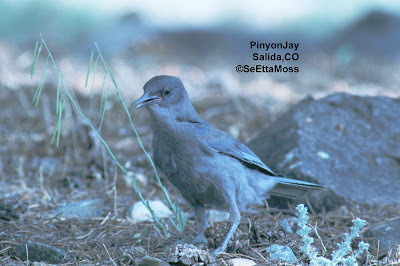 Yesterday I found a large flock of 75-100 Pinyon Jays in a sprawling subdivision to the little town of Salida, CO. Included in the flock were birds in juvenal plumage. I watched several of them foraging for pinyon pine seeds on the ground. Every bird I watched took the pine nut to a flattish rock then they jabbed the nuts with their bills to crack them open by using their toes to hold them in position. Apparently they have learned that it is difficult to crack open the nuts on the softer surface of the ground so they use the nearby rocks. As the ground under the pinyon trees was quite rocky, they didn't have to go far to find a rock and this saved the time it would take to go to one of the trees to wedge the nuts in the bark for stability when opening them. Very bright birds.